TOPICS:Pet Valu Walk for Dog Guides. 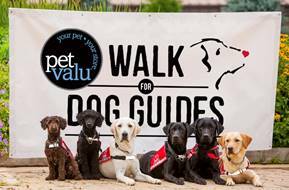 Oakville/Chilliwack — With only a few days left, Chilliwack residents and their four-legged “best friends” are preparing to walk together for the May 27th Pet Valu Walk for Dog Guides. To register, visit www.walkfordogguides.com. Dogs are welcome to participate, but you do not need one to join. While each Dog Guide costs an average of $25,000, they are provided free of charge to qualifying Canadians. Lions Foundation of Canada Dog Guides receives no government funding and relies solely on donations from individuals, corporations, and fundraising activities. This is why the Pet Valu Walk for Dog Guides is so important. Be the first to comment on "Chilliwack Walk for Dog Guides Sunday May 27"